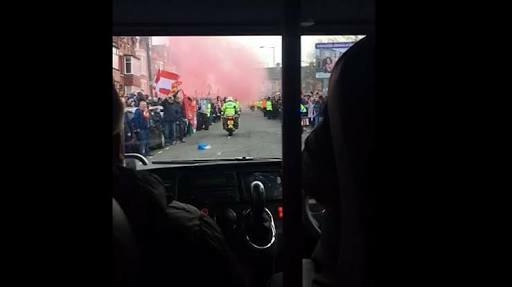 Humb's Sport has obtained new footage from inside the Manchester City team coach showing the extent of their ordeal as they approached Anfield on Wednesday night ahead of their Champions League tie with Liverpool. The four-minute film - recorded by an unknown member of staff - highlights the noise of bottles, cans and flares hitting the bus and the reaction of people on board, as the City team arrived to face Liverpool in the first leg of their Champions League quarter-final tie. Liverpool have apologised, Merseyside Police are investigating and European football's governing body Uefa has opened disciplinary proceedings against Liverpool.